After Raw went of the air, Bill Goldberg came out to address the fans in a segment that aired in full on the WWE Network. Goldberg said that this was not part of the show and was speaking from the heart but wanted to tell the whole story of how his return came about. Some fans were being disrespectful chanting “What?” and Goldberg quickly silenced them down and won over the Orlando crowd who wasn’t very kind to Goldberg earlier in the show. The former Universal champion said that everything he does now is for his family, and he wakes up every morning because of his little boy who never saw him compete before. He said he’s the luckiest man alive and is thankful for having the opportunity the past several months to do what he did. He invited his kid in the ring and his son took a bump after slipping on the security wall. The crowd went “ooooh” but Goldberg said that his son is already learning to take bumps and said that he took one more than he ever did in his entire career until Sunday, a line which drew a good laugh and pop from the crowd. Goldberg said that we can’t imagine how proud he was when he went to his son’s school to show them the WWE Universal title and talk with them and said that nothing in life will take that away from him. 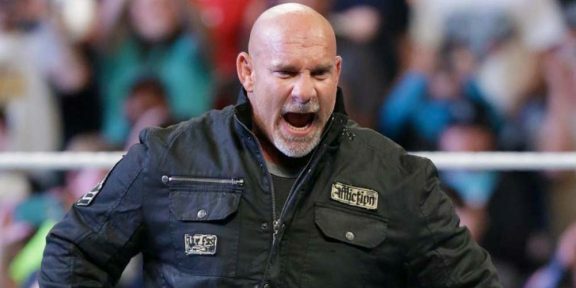 Before leaving the ring, Goldberg picked up the mic and said, “Never…say never!” and then bowed down to every side of the ring to say thank you to the fans who in return gave him a standing ovation.